The RMA Corboda is a class 3 vehicle with a load carrying capacity of 220kgs. The Cordoba has high and low speed setting both of which are infinitely adjustable making this vehicle suitable for almost any type of use. 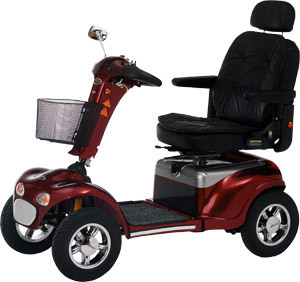 The Cordoba is bristling with luxury features such as a fully adjustable captain seat with buttoned back, full independent suspension and delta handle features which when combined produce one of the most comfortable scooters available today.